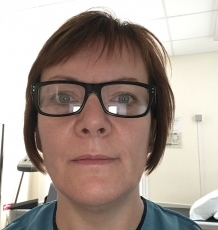 Diane is a radiographer working within the rheumatology department in Aberdeen, solely working within DXA department performing scans, and reporting normal scans. This can be based in Aberdeen or in remote and rural settings using our mobile scanner. She has worked in breast imaging and also in paediatrics, and she enjoys the challenge of scanning some of our younger patients. She is keen to develop links with RGU to re-introduce a student presence in the department. Diane lives in the country, approximately 30 miles inland of Aberdeen, married with 2 almost grown up children, and 2 spaniels. Atypical Femoral Shaft Fractures (AFF) in NHS Grampian: incidence, underlying associations and assessment of DXA scanner software designed for early identification of AFF. Supervisors are Prof Karen Knapp and Dr Chris Morris in Exeter and Dr Rosemary Hollick in Aberdeen. Funded partly by NHS Grampian, with support from the Aberdeen osteoporosis support group.